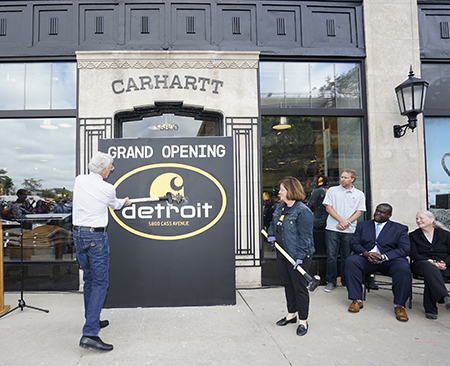 The newest Carhartt retail store opened its doors Friday in Detroit’s Midtown District. The store, 5800 Cass Ave., officially opened its doors to the public this morning when Carhartt executives used sledgehammers to smash through a panel of drywall, instead of a ribbon cutting ceremony. Carhartt occupies the first floor of the three-story, 51,000-square-foot building, and will offer denim, outerwear, a performance line, water-repellent outerwear, and canvas cargo pants along with flannel shirts, T-shirts, shorts, and pants. The store is in the former home of Cass Motor Sales, listed on the National Register of Historic Places. The building was constructed in 1928 by famed local architect Charles Degree, following an art deco design and construction, to serve as an automobile showroom. The flagship retail store marks the brand’s 20th company-owned store. For more on Carhartt, read DBusiness Daily News’ interview with Mia Isom, Carhartt’s new director of technical design.